If there’s one thing folks from Los Angeles are craving at any given time, it’s New York-style pizza. But even UberEATS may not be ready to book that delivery. Apparently the fast-food flavorings of In-And-Out isn’t enough, because even in LA, NYC pizza reigns king. And JetBlue delivers – literally. 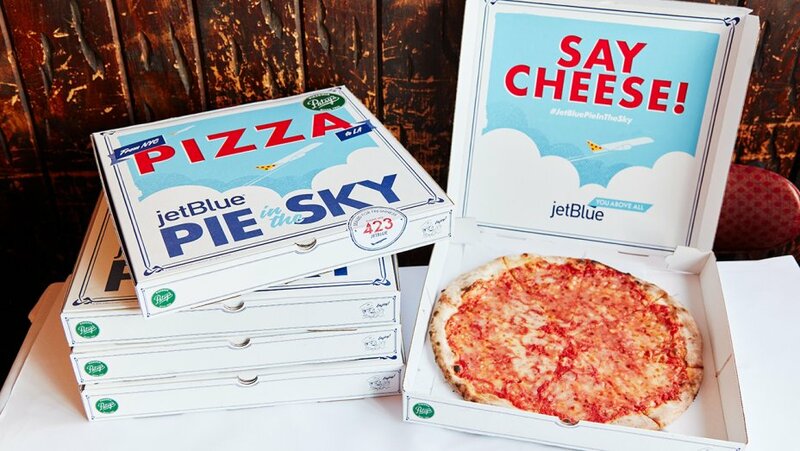 In their latest marketing stunt increased transcontinental flights, JetBlue has offered to make the coasts closer than ever by hand delivery 350 pizzas per flight across the 11 daily flights from NYC to LAX. Don’t get too excited though – like all great pizza offers, this was for a limited time only, with deliveries ranging over May 9-11, 2018. Customers lucky enough to partake in the transcontinental pizza experience had two choices; a cheese pizza for $12, or a pepperoni for $15, and both fly pies were kneaded and cooked at a Harlem classic, Patsy’s Pizzeria. 3,000 miles might seem like a long way to travel for pizza, but for real pizza aficionados, there’s nothing like an authentic NYC slice. This is definitely not the kind of ad spot you want to be watching before lunch – unless you’re on your way to the Big Apple with pizza in mind already. Using food as a ploy for marketing is far from a new idea, and pizza has been in the news some public works marketing stunts. But, I have to say, I’ve never heard of a company willing to go as far as 30,000 ft and fly something as simple as pizza across the country to increase sales. That being said, if they ever do reinstate that and offer delivery to Boston, you’ll see me sporting a NYC slice. Plus, it’d probably get here faster than Domino’s anyway. Leave it to JetBlue come up with a such a clever promotion. Who doesn’t like pizza? They even added a sense of urgency by stating it’s first come, first serve. Just saw a ton of good comments on JetBlues social media about the promotion. Thanks for making me want pizza, Howard Davidson! That’s a lot of cheese and strategy, Howard Davidson. Great promotion from the brilliant minds at JetBlue. They really know marketing engagement. At Logan Airport, the kiosks are very user friendly and they have staff at the ready to help use the machine. So, they got brains, kiosks and pizza. Tasty campaign from the creative minds at JetBlue. Who would’ve thought years ago that an airline would be using pizza for lead generation and brand awareness? I see on your http://www.howarddavidson.com site that you offer marketing strategy and brand awareness. Maybe you could suggest a similar campaign to SouthWest Airlines. Come on Howard, go for it! Pie in the sky! JetBlue’s promotion where the brand delivers New York City pizza from New York to Los Angeles to hundreds of customers is pretty brilliant because. As a CMO for a b2c company, I see how the promotion adopts a very familiar cultural artifact – food delivery – to normalize traveling coast-to-coast, psychologically shortening the perception of those 3,000 miles. A tasting and winning combination, Howard Davidson!